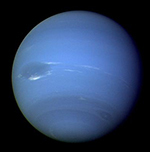 NASA’s Hubble Space Telescope has discovered a new moon orbiting the distant blue-green planet Neptune, the 14th known to be circling the giant planet. The moon, designated S/2004 N 1, is estimated to be no more than 12 miles across, making it the smallest known moon in the Neptunian system. It is so small and dim that it is roughly 100 million times fainter than the faintest star that can be seen with the naked eye. 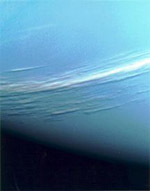 It even escaped detection by NASA’s Voyager 2 spacecraft, which flew past Neptune in 1989 and surveyed the planet’s system of moons and rings.